Three or more years of regular judging experience. Be eligible to judge Level 6. Have attended and passed the exam for the Rally Regulations and Judging Procedure seminar and attended the Practical Seminar. Those interested should send their applications to the Working Dog Activities Team, The Kennel Club, Clarges Street, London W1J 8AB or via email to rally@thekennelclub.org.uk by Friday 22nd June 2018. Rally Levels. Rally Signs. Performance. Scoring guidelines. Test Design. Judges Qualifications. Event Management. We have until 17th April 2018 to submit any questions, queries or consultation responses to the working party, so come along and get the facts about things that will have an impact on our sport. To book a place either fill in the slip below & send it, along with your payment (cheques made payable to Nuneaton Dog Training Club), To:4 Sycamore Road, Kingsbury, B78 2JE or send an e-mail to juliabsuzuki@hotmail.com & pay via PayPal using the same e-mail address. The Rally Working Party has recently reviewed the S regulations. 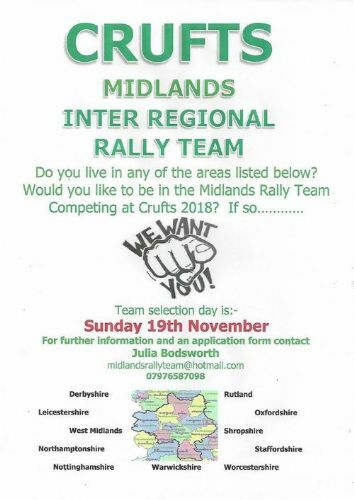 This review has included all areas of rally and has taken into account personal observations, feedback received and issues raised by competitors over time. It has now reached the stage of more formal consultation in order for competitors to understand the amendments prior to them going live, and to allow for feedback. Some regulation changes will be introduced from January 2018, but the majority are planned for implementation in January 2019, subject to the results of the consultation process. The summary document and annexes set out the changes in more detail and can be viewed at www.thekennelclub.org.uk/activities/rally/rally-working-party/. Should you wish to submit a consultation response or have any questions or queries about this process, please contact a member of the working party using the contact details listed at www.thekennelclub.org.uk/activities/rally/rally-working-party/rally-working-party-members/. The consultation is now open, and ends on Tuesday 17th April 2018. Please submit any responses prior to that date. Presentation & multiple choice assessment. Old Hinckley Road Nuneaton CV10 0AA. The requirements of a Rally Judge will be covered in this presentation with detailed explainations of the Kennel Club Regulations (S). The presentation will be followed by a multiple choice assessment which is a requirement for all new Rally Judges. judging seminar'. If there is sufficient interest this can be planned for a later date.